Having worked in a number of film industries across Indian cinema, Sonali Kulkarni is all set to impress in the forthcoming directorial debut by Shreyas Talpade, Poster Boys. 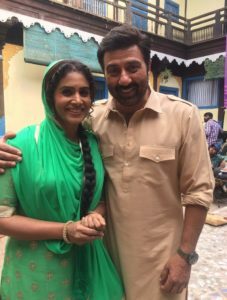 Cast as Sunny Deol’s reel wife in the film, Sonali has forged a bond with the veteran actor. The National Award-winner had worked with Sunny in the past, in a film project titled, The Man, which didn’t make it to screen at the time. Having witnessed the talented actress’ work in the unreleased film, Sunny recommended her to Shreyas Talpade for the upcoming film. The film stars Sunny Deol, Bobby Deol, Shreyas Talpade, is directed by Shreyas Talpade, presented by Dharmendra and Sony Pictures Networks Productions, and produced by Sony Pictures Networks Productions, Sunny Sounds and Affluence Movies. Poster Boys releases in cinemas on 8th September 2017.